Mr. Everett A. Carr, 88 of 1111 Airport Rd., passed away July 12th, 2018 at Cape Fear Valley Medical Center in Fayetteville. A memorial service will be held Monday, July 16 at 2:00 pm at First United Methodist Church, 208 Sampson St., Clinton with visitation to follow in the church fellowship hall. The Rev. T.R. Miller will officiate. Born on July 23rd, 1929, Everett was the son of the late Hubert and Annie Everett Jackson Carr. He attended Brevard College and graduated from Atlantic Christian College. After a brief career in the agricultural industry, he became a stock broker and opened United Securities in Clinton which later became Interstate/Johnson Lane. He loved this work and remained in the business more than forty years. During his tenure there, he served on the Board of Directors of Interstate/Johnson Lane for several terms. He was active in the community through various organizations and activities. 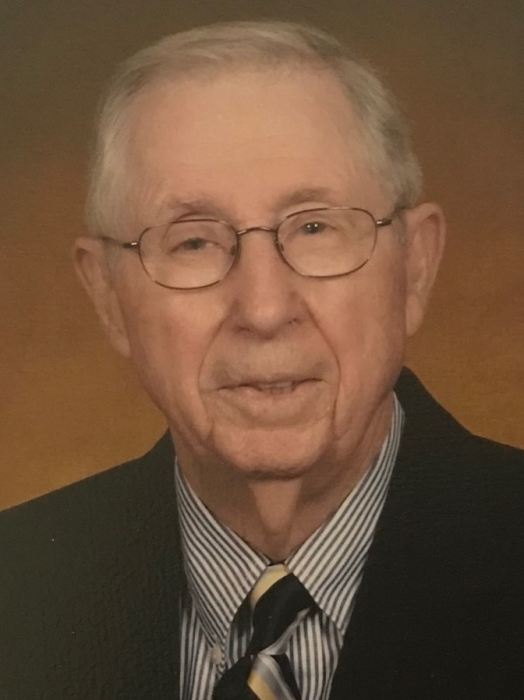 He served as the Chair of the Board of Sampson Community College, President of the Rotary Club, a Director of the Chamber of Commerce, and was a long time member of the Highway 24 Committee. He was also a member of First United Methodist Church and was a Mason in the Mingo Lodge. His real love, however, was his family. Everett is survived by his wife, Louetta Herring Carr of the home; his daughter, Sheila Carr Kinsey and husband, Jim of Fayetteville; his son, Hubert Nixon Carr and wife, Mary Jo of Clinton; his six grandchildren: Anna Elizabeth Carr Andrews and husband, Phillip, Sarah Carr Stone and husband, Matt, Hannah Carr Baxter and husband, Tyler, Rachel Carr Grantham and husband, Dalton, Madison Carr Kinsey and James Everett Kinsey as well as his four great-grandchildren. Everett is also survived by his sister, Frances Carr Hayes and husband, George of Greensboro; his brother, Robert B. Carr and wife Loray of Dunn and two sisters-in-law Doris Carr of Dunn and Faye Carr of Clinton. In addition to his parents, Everett was preceded in death by three brothers and one sister: Richard J. Carr, Jerry T. Carr, Eugene B. Carr, and Mary Ann Carr Warren. Royal-Hall is honored to serve the Carr family.